This is a combination of two recipes. A very tasty combination to be honest! (1) Lightly fry Garlic and Onions then add the Beef strips and continue to fry for a few minutes. (2) Add the Tomato Purée, spices, chopped vegetables and other ingredients then sweat down on a low heat for 10 minutes. (3) Add the Stock and simmer until the vegetables are cooked and the Turnip is tender. 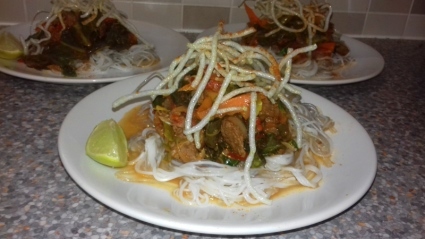 (4) Add Rice Noodles to boiling water and simmer. (5) Add the Coriander and simmer for a further minute. (6) Drain the noodles and ladle the sauce over the top. (7) Add fresh Coriander to garnish. Serve with a scattering of deep fried Noodles, a slice of Lime, Tomato and Cucumber salad and Naan Bread perhaps?